My weakness for good deals landed me with 4lb of blueberries in the span of one week. I briefly considered consecutive meals of nothing but fresh blueberries but that idea quickly went out the window. I’ll spare you from corny gems such as “I bake therefore I am”. Just take my word that I decided the amount of joy I would derive from baking 4lb of blueberries far exceeds the joy of eating them out of hand. Breakfast and dessert for the whole week took on a deep shade of reddish purple with a healthy splash of glistening amber maple. With its super food association, even the most decadent cake takes on a healthy glow when studded with handfuls of blueberries. I assure you, I used much more than a handful when I kicked off with Blueberry White Chocolate Buttermilk Bundt draped with Cream Cheese Glaze. 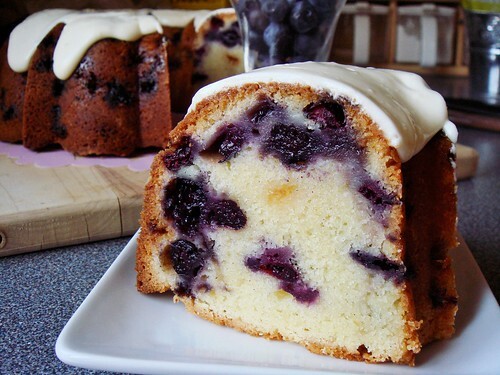 Three heaping cups of blueberries were joined by one cup of white chocolate chips, two sticks of butter, and the thickest blanket of cream cheese icing. Umm, yeah, healthy. The tangy buttermilk cake sure was good though. Both cake and glaze were recipes I adapted from smitten kitchen. It’s showy and comforting in the best possible way. Just looking at the slice now makes me want to sit down with a cup of coffee and a fork. And a friend. 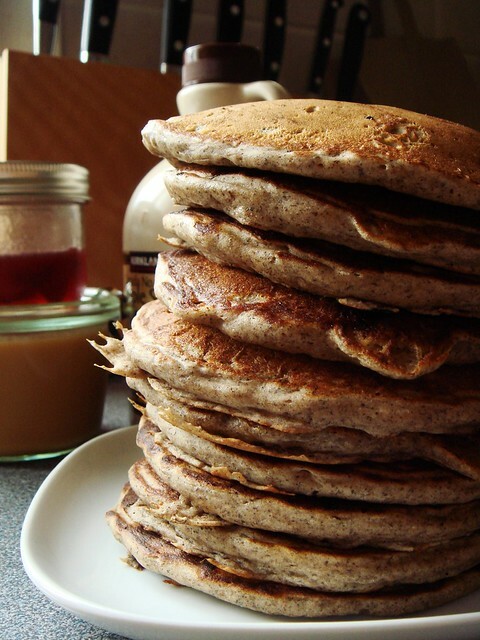 Next was a tall stack of blueberry buckwheat pancakes inspired by Market Lunch at Washington DC’s Eastern Market. People in the know call it “blue buck” and the funny name stuck with me. I took my favourite buckwheat pancake recipe from Simply Recipes and added a touch of cardamom and ginger. The blueberries were carefully placed onto the half-cooked batter before I flipped each pancake. Obviously I did not skimp and overloaded each pancake with as many berries as I could. Thank goodness I have my trusty oversize pancake spatula. I filled my breakfast table with various toppings including maple syrup, golden cane syrup, strawberry guava syrup, and homemade dulce de leche. Guess which one was the most popular? 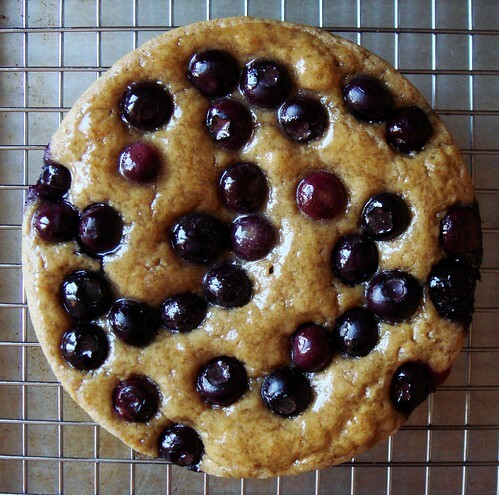 I browsed many blueberry recipes last week but one that I kept returning was Melissa Clark’s Maple Blueberry Tea Cake with Maple Glaze from her book Cook This Now!. The draw of a quick bread loaf made with whole wheat flour and sweetened entirely with maple syrup intrigued me. Rather than baking a loaf cake, I divided the batter between two 6-inch round cake pans to make two small rounds instead. The shiny maple glaze made all the blueberry bubbles look so plump. They beckoned me to pluck one off the cake for a taste. Of course I didn’t. Each of those cakes went to different friends as thank you gifts for taking care of me. 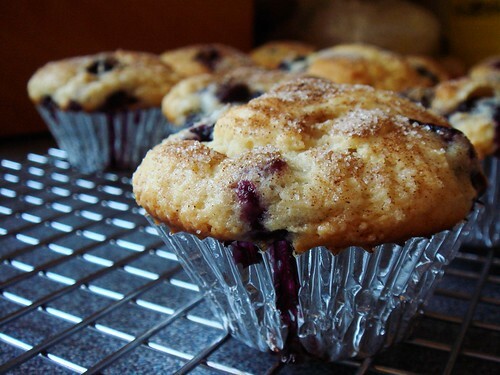 No Blueberry Festival is complete without classic Blueberry Muffins. I used the reliable recipe from Cook’s Illustrated that turns out handsome round domes every time. Coincidentally, it was National Blueberry Muffin Day when I baked the muffins. Not that I was paying attention or anything. No, I did not deck the halls either. I used whole milk yogurt in place of sour cream and added a cardamom sugar topping to the muffins for a pleasant sugary crunch. 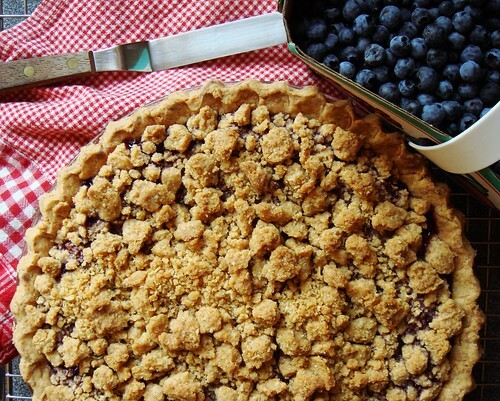 My week concluded with another pièce de résistance, Mixed Berries Streusel Pie. Everybody loves pie, right? I was standing at the magazine aisle flipping through the new America’s Test Kitchen Best Summer Desserts when this recipe caught my attention. The pressed-in-pan crust was made in part with graham cracker crumbs and enriched with cream cheese. A portion of the crust went on to combine with oats and brown sugar to create the streusel topping. That alone was enough reason for me to give this recipe a try. I used a mix of blueberries, raspberries, and ground cherries for the tutti frutti filling. The aroma of this pie was amazing. Just having it sitting on the kitchen counter and perfuming my house was enough to make me smile ear to ear. What is conspicuously missing is a blueberry mascarpone roulade that I was suppose to make for French Fridays with Dorie. Oh I tried to convince myself to make that recipe but it simply did not appeal. In a way, my Blueberry Festival is an act of procrastination. I dragged my feet day after day thinking I really ought to make the roulade but……..nah, I would make something else. Well, procrastination won this week. No roulade for me. 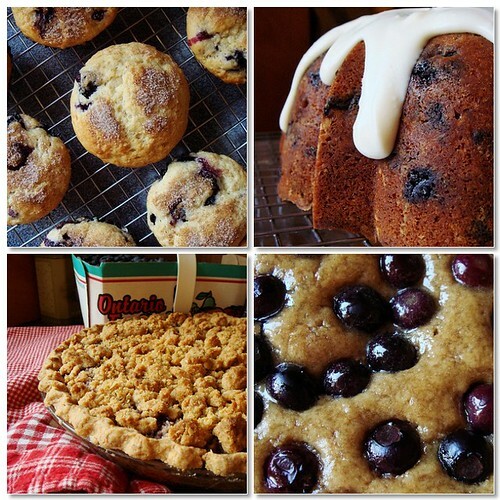 Still looking for more blueberry ideas?